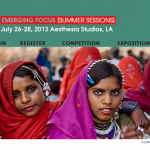 El Fotómata » Emerging Focus Photo Seminars/Tours – Last Week! Emerging Focus Photo Seminars/Tours – Last Week! 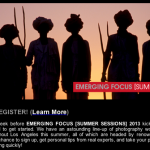 We are proud to announce the EMERGING FOCUS [SUMMER SESSIONS] July 2013, will be partnering with photo l.a. & Aesthesia Studios in Culver City, Los Angeles. This three day event will showcase over 20 seminars spanning a range of photography topics from fine art and commercial photography, tips and techniques, to hands-on training from leading experts.